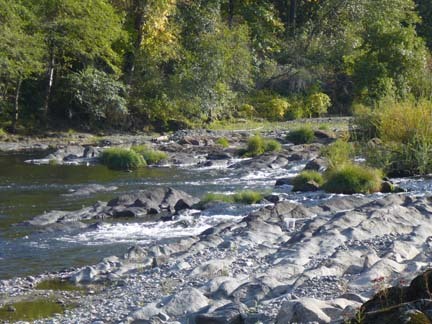 We are very excited to announce that we have identified more than ten miles, in 19 separate locations, along the South Umpqua River in the vicinity of Roseburg, southern Oregon. This is located about 1.5 hours north of where we have been dredging the past few seasons on the Rogue River. The South Umpqua is a smaller, slower, warmer waterway than the Rogue! This will be a much easier place to work, especially for beginning-dredgers. The South Umpqua Looks Good for Suction Dredging, Panning and Hand-sluicing!